Holmes says: The sheer landmass involved in this flood makes it incredibly noteworthy. Across Illinois, Missouri, Kentucky, Tennessee, Arkansas, Mississippi and Louisiana, some 16 million acres of land (26,000 square miles) were inundated with water from the mighty Mississippi. At Vicksburg, Mississippi, alone, the river was 80 miles wide. 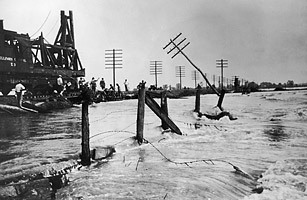 This flood shifted the influence of flood policy in the U.S., which is still impacting us today. Everything  our levee policies, the way we engineer all of these things  was built out of what people learned from the 1927 flood. See dramatic photos of the Mississippi River flooding.